As I have become more involved with Scouting and Guiding (it’s the same thing, anyway) both at the national and the international level, my obligations there are keeping me busy. There is no complaint from me because of this – I just wish to mention it to acknowledge that this blog, and my Tolkien writings in general, for me are at a lower priority than my Scouting, and so delays must be expected, as also this month. 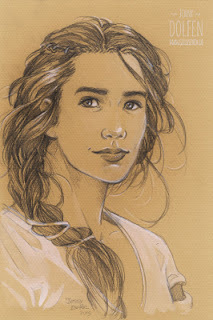 On the occasion of the 25th anniversary of Taruithorn, the Oxford Tolkien Society, the society’s blog, the Miruvor, has been very active throughout May. Do take a look (see the blog roll below) and find some of the interesting articles. And of course, warm congratulations to Taruithorn, may you find yourselves even stronger for the 50th anniversary. The story of a presentation copy of the first edition of The Hobbit being up for sale at Sotheby’s. The dispute is perhaps not particularly interesting to readers of this, but some may remember the old ZX Spectrum game fondly and thus be interested in the news of its revival. The field for the Mythopoeic Scholarship Award in Inklings Studies has two titles focusing on C.S. Lewis and three titles focusing on Tolkien, including Beowulf: A Translation and Commentary. Together with Sellic Spell by J.R.R. Tolkien and edited by Christopher Tolkien. Knowing full well (from experience) that I am entirely unable to foresee the winner, I will eagerly await the announcement of the winners. A short report (in German) on the first day of the DTG Tolkien Seminar. Medievalist.net is serving up a wealth of tweets related to the Kalamazoo Medievalist congress. 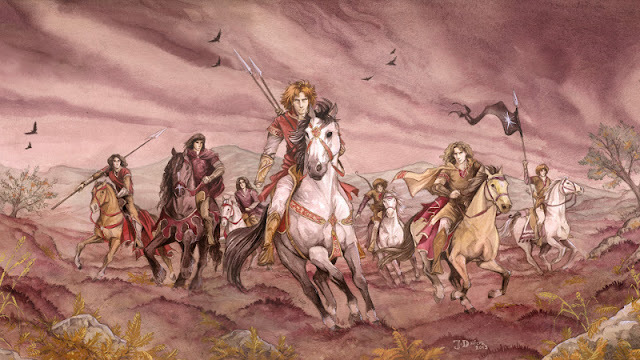 In this essay Simon Cook takes a look at connections involving the shoreless / sundering sea between Tolkien’s legendarium and ancient northern myths and legends. In this essay Cook focuses on the ideas of arriving from and departure across the Sea, particularly of rulers, but also of the vistas of what may lie beyond the Sea. 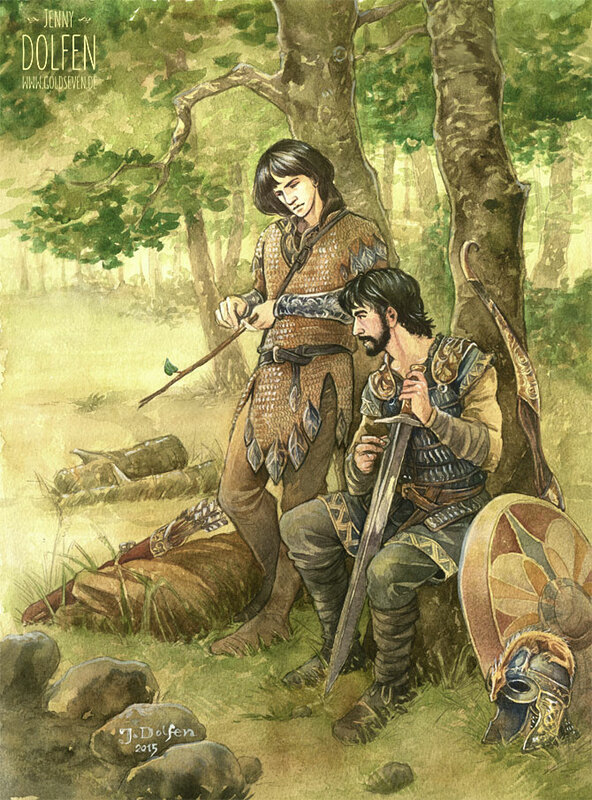 Old English and Danish myths and legends are vowen together in Beowulf and in Tolkien’s Middle-earth writings, from the early Book of Lost Tales through The Notion Club Papers and The Lord of the Rings. The essay form suits Cook’s explorations eminently – it doesn’t pretend to be exhaustive or the final word on the matter, but explores a particular potential connection, trying to follow that particular stream back to see where it leads (and, if possible, to its spring), ignoring other streams that contribute to the creek, but without dismissing their existence. Boëthius’ Consolation of Philosophy is often mentioned in connection with Tolkien as one of the possible sources for some of the philosophical ideas unpinning Tolkien’s work (or at least as a, to modern readers, fairly accessible medieval representative of these ideas), and so the provenance of early copies of Boëthius from the British Isles is also interesting in a Tolkienian context. When reading this, there is, to some extent, a sense of seeing someone re-invent the wheel and then cry out Eureka!. Professor Ordway is, to a large extent, battling some very aged wind-mills when she claims that Tolkien’s modern sources are largely unrecognised, or in her discovery of Morris’ influence on Tolkien. However, though there is nothing new about the connection between the Dead Marshes and Morris’ “ Huns and Romans, as in The House of the Wolfings or The Roots of the Mountains.” (Letters no. 226), I cannot recall seeing this particular connection analysed to the extend that Ordway does, and does interestingly, here. So, all in all, a more detailed and thorough study than previously seen of a very much recognised connection. Unfortunately I haven’t had time to read through this paper myself, but both St. Augustine and St. Thomas Aquinas are often mentioned among Tolkien’s philosophical inspirations, and I cannot help but wonder how this paper will line up with e.g. Faramir’s wonderful speech about not loving “the bright sword for its sharpness, nor the arrow for its swiftness, nor the warrior for his glory.” (LotR, book IV, ch. 5). Possibly a bit tangential to the normal topics of these transactions, but the story of George Henry Bonner does, as John Garth implies in the title, tell another bit of the story of the Great War and what it did to that generation of young men to which Tolkien also belonged. The tragedy did not end in 1918. The Southampton Tolkien Reading Group has now reached book II of The Lord of the Rings and used a whole meeting (with everyone present) to discuss the first chapter, ‘Many Meetings’. A few points caught my attention. Gandalf’s concern about the situation in the barrow, which he appears to take more seriously than the attack at Weathertop, is puzzling, indeed. A discussion about the differences in the sitations with the Master Ring in Tom Bombadil’s house and Rivendell appears to have focused on place rather than people, which made me curious. Also there are some bits that appear, at least to me, to assign a greater sense of agency to the Master Ring than I feel is entirely justified, though Tolkien has managed to make this inanimate object appear almost as an independent character in the story, reflecting the personification that the actual characters apply to it. It seems that writers of books about the inklings have begun to write lengthy articles based on their books as part of the promotion of the book. So the Zaleskis here produce a lengthy article based on their new book about the inklings, The Fellowship: The Literary Lives of the Inklings: J.R.R. Tolkien, C.S. Lewis, Owen Barfield, Charles Williams. This is one of the – over the past few years quite rare – instances where I have to say that I mostly disagree with Martinez. First of all, I think his understanding of scientists’ approach to Tolkien’s work is, at least, insufficient – scientists are analysing Tolkien’s work from a lot of different perspectives and for a number of reasons. In many cases, the scientist is more concerned with helping the reader to understand their science than they are with understanding Tolkien (see for instance Henry Gee’s excellent The Science of Middle-earth), in some cases the primary concern is a type of source study, where Tolkien’s understanding of the Primary World is seen as a source, and many other concerns are also seen, but I doubt that the desire for Middle-earth to be real a factor for many scientists – if for any at all. 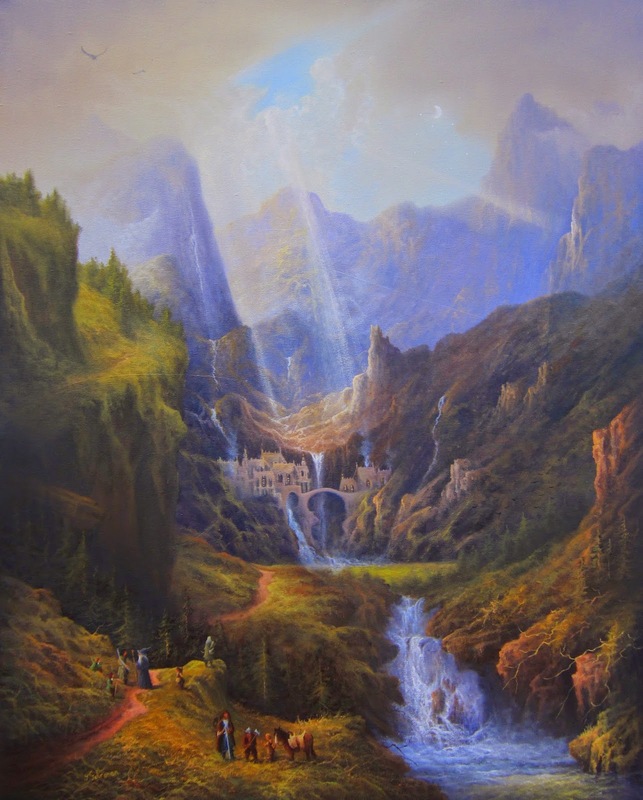 Secondly, I firmly agree with Verlyn Flieger when she states that “for a major fantasy [The Lord of the Rings] has suprisingly few actual fantastic elements in it” (for a more thorough understanding, read Flieger’s essay ‘Fantasy and Reality: J.R.R. Tolkien’s World and the Fairy-Story Essay’ in Green Suns and Faërie: Essays on J.R.R. Tolkien), and with the realisation that in Tolkien’s work the fantastic element is actually quite exceptional, I have to reject one of the basic assumptions in Martinez’ post. Finally, speaking as a physicist, I tend to disagree with Martinez’ exposition about the relation between science and the spiritual (incl. the divine). The divine is inherently outside the scope of science and thus any idea of scientifically testing the divine inherently nonsensical from a scientific viewpoint (this, obviously, has nothing to do with testing much of the nonsense that is proposed that is within the scope of science, but trying to argue based on the divine, which is outside – such can generally be summarily dismissed). I could wish that I had the time for a sustained critique of Mr Puschak’s points here. Not that I entirely disagree with everything he says, but I feel that he also misses a lot of important points about stories and story-telling that are pertinent to the points he tries to make. But read and watch this for yourself and instead of merely fully rejecting or fully accepting each claim, you might spend a few seconds considering the circumstances in which the claim is true and false respectively. A short piece referring to a 2007 article from Mythlore, that addresses Lewis’ relation with Catholicism by way of his friendship and differences with Tolkien. Published on a Catholic web-site (CatholicCulture.org). 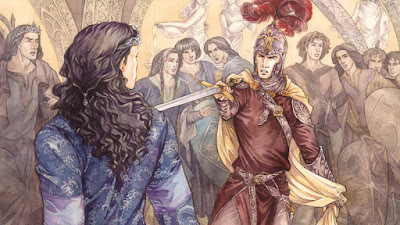 Reactions and further thoughts on Jason Fisher’s April post about Tolkien and the Nobel prize. About a letter sent by Tolkien to William B. Ready at the Marquette in 1957, including a transcript of the letter. Though I find expressions such as ‘infatuated and besotted’ a rather offensive way to describe the enchantment of Tolkien’s work (and other expressions have that same slightly mocking air), the list of serious applications of scientific models to Tolkien’s sub-creation is intriguing. The climate scientist, professor Dan Lunt, points out that ’The serious point to the study was that it showed that climate models are not just statistical models tuned to observations, but are based on fundamental physics and thus can be applied to any planet, real or imagined.’ The same can be said for the other pieces of research: the point is to take the models, that are based on fundamental science, and show that they can be applied broadly to the human experience. Starting with the sub-title, “It wasn’t Christianity that gave a pack of old fogeys like the Inklings the power to rule the world”, it is quite clear that the agenda is a criticism of the narrow perspective of Christian analyses of the Inklings; most recently, and the seeming trigger for this article, the book by the Zaleskis. I might put things differently – attempting a more balanced approach – but overall I think it is important to provide a corrective to the large number of critical analyses that offer a specifically Christian reading of Tolkien. Working on the bibliography for the next Tolkien Studies, covering 2013, Bratman has a few reflections both on what is covered, but also what is not covered by the journal’s annual bibliography listing. I think I might be able to identify some work published only on the internet, that would probably be worth including in a more comprehensive bibliography. I am less certain about non-English … as I see it, there is a limit to how much you can do with Tolkien scholarship in other languages, because, among other things, you need to be able to work with Tolkien’s own critical vocabulary, even if you do not adopt it as your own – trying to translate this vocabulary of complex concepts and ideas simply do not work well enough for the detailed understanding needed for scholarship at the level of the forefront of modern Tolkien studies. A thorough and excellent review of this volume, applauding the diversity of voices in the collection, while pointing out some of the weaknesses. Andrew Higgins reviews the 2013 Cormarë volume on Tolkien’s poetry. Quite possibly merely a result of differing interests and tastes, but Higgins’ descriptions of the essays that make up this collection made me reconsider whether I would buy it or not, putting it back on the list of ‘let me try it from the library first’ books. But that, too, is one of the reasons for reviews, and quite possibly to be more grateful for than an enthused review that makes you want to rush out and buy the book. A quite nice article about Tolkien’s relationship to Birmingham. Overall a very good article, though the usual tower-myth does get aired (with the ‘the possible inspiration’ qualifier, which seems to be journalist-speak for ‘there’s absolutely nothing to support this, but people like to believe it anyway’). First part of a series offering a detailed analysis of the calendars of Tolkien’s Middle-earth. Undoubtedly the most knowledgeable and intelligent discussion that I have seen anywhere of the article and book by the Zaleskis. I repeat the link to the Tolkien Estate web-site, which saw the launch of a major re-design last month, which is now being commented and reviewed by various Tolkienists. Discover Tolkien from the Library of Birmingham. Gallery, videos, and other material relating Tolkien’s early life in Birmingham. See the front page for a list of recent posts.